We love sausage rolls! But sausage mince isn't very healthy. We've made them with beef mince and they are great too. 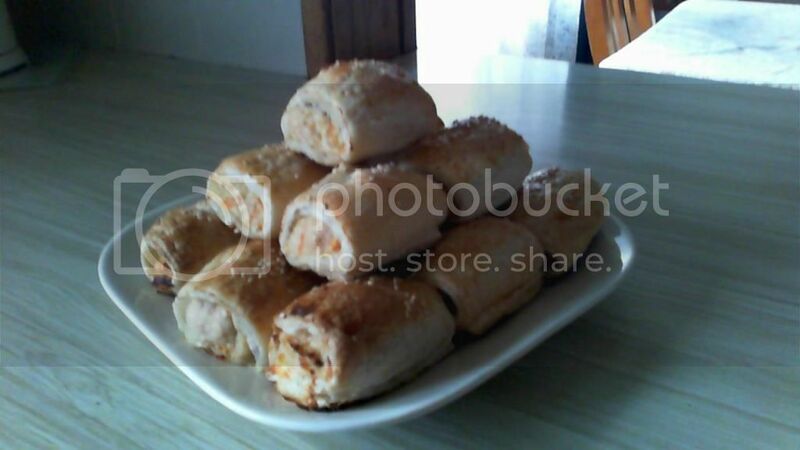 I make Pizza Sausage Rolls every so often too. But I thought I'd make some with chicken mince for something different. Combine the first 5 ingredients with your hands in a large bowl until well combined. Cut sheets of pastry in half lengthwise. Spoon mince mixture along the long edge of each piece of pastry and roll up. Brushing the joining edge with a little milk to stick together. Cut each roll into four piece. Brush each roll with more milk and sprinkle with seeds if using. Baking in the oven for about 20 mins or so, or until lightly golden brown. Serve with your choice of sauce. I had sour cream and sweet chilli with mine mmm. Don't over cook though. Chicken mince is very lean and if they are over cooked they'll be very dry. You could easily add other vegies into these and bulk it out more to use up all 6 sheets of pastry in the pack. I made some apricot turnovers with my leftover sheets and had with some leftover whipped cream for dessert. Hope you give these a go. Oh dear. I'm reading this post during my lunch break. Not a good idea. Yum! Plus they sound easy - which is really my criteria for all recipes! Hi! I live in beautiful Port Elliot with my fiance Brian and three of our four gorgeous boys. Randall (18yo), Ethan (5yo), Eli (4yo). I love to crochet, scrap, bake and strive for a simple homemade life.